Still haven't seen last year's Tony Award winner for Best Musical? Well theatre fans there is no better time than right now. A Gentleman's Guide To Love And Murder which won four Tony Awards including Broadway's top prize continues to delight audiences eight times a week at the Walter Kerr Theatre on Broadway. Now despite glowing reviews the show didn't really take off until after the awards. Good thing it won now isn't it?Now for those of you who don't know anything about the show here is a little synopsis about A Gentleman's Guide To Love and Murder to give you a little more information. Enjoy! When Monty Navarro, a disinherited relative of the rich and powerful D'Ysquith clan, learns he's ninth in line to inherit the earldom, he sets out to secure his future by process of elimination. Each of the eight heirs perilously standing in the way of Monty's fortune are played by Tony® Award-winner Jefferson Mays, in one of the most tireless, whiplash-inducing performances ever attempted on the American stage. Based on the novel Israel Rank by Roy Horniman and set in England's elegant Edwardian era, this uproarious new musical comedy shows just how low we'll go to make it to the top. Sounds like a hoot and a half now doesn't it? I can't remember a time I laughed so much at a show. Actually I can. It was Avenue Q. However trust me when I say that A Gentleman's Guide To Love and Murder is a totally different kind of show. In a good way of course. By the way for those of you looking to get tickets to the show you are in luck. We sell it. 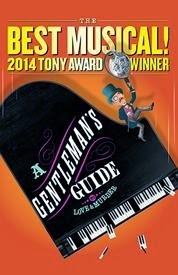 Get your tickets to see A Gentleman's Guide To Love and Murder on Broadway at the Walter Kerr Theatre. You will love it. Until next time theatre fans.